An oyster filé gumbo, made with the Trinity, oysters, a chicken and spicy andouille sausage. My father-in-law has been buying full sacks of Gulf oysters the past few weeks and we have been the lucky recipients of several pints, stuffed with delicious, salty, freshly shucked oysters and plenty of liquor. Dad also makes this wonderful oyster gumbo and he usually sends a quart of that over too. I know. My in-laws are wonderful people, I love them to death, and yes. I am spoiled rotten. Dad's gumbo is more of a filé gumbo because he doesn't use okra in his gumbo, though I've seen some recipes that do. His oyster gumbo is also made with a pale roux, always spicy andouille sausage, plenty of cayenne and no tomatoes. Gumbo Filé (pronounced fee-lay) is used to both season and thicken gumbo, particularly when okra is not used. It is ground from dried leaves of a sassafras tree and is offered as a condiment at the table, or added only at the end of the cooking process, but should never be boiled. The flavor is somewhere around the taste of a cross between savory and thyme. 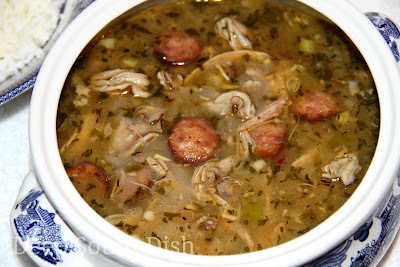 To me a gumbo with oysters really calls out for andouille, but if you don't want the fire you can certainly substitute a good basic, smoked sausage, or even some nice smoked ham. You will definitely lose that highly sought after seasoning from the andouille that really just fits right in with oyster gumbo, so I'd suggest bumping up some of the other seasonings. Remember though, that it's real easy to go overboard with the Cajun seasoning or cayenne, so always add a little, taste and adjust. You can always add more, but you just can't take it away. As always, gumbo is a dish that only improves with advance preparation, so make it ahead of time whenever possible. The flavors really need time to settle and mellow and it's always better the next day. Prepare, let cool and skim any accumulated oil off the top before storing. You might be surprised to know that some form of seafood gumbo, and very often oyster, graces the Christmas table for many of us down here in the Deep South. Here's how to make this one. Season the chicken all over with salt, pepper and Cajun seasoning; set aside. Chop up all of the vegetables; set aside. Heat oil in a large pot or Dutch oven and brown chicken on all sides. Remove and set aside. Prepare the roux by stirring in the flour and cook, stirring constantly, over medium high heat, until mixture is a golden color, about 15 minutes. Add the onion, bell pepper and celery and cook, stirring regularly, about 5 minutes or until tender; add the garlic and cook another minute. Scoop any bones out of the pot and discard, add the oysters with all the liquor, and the green onion and parsley, bring to a boil, reduce heat and simmer until the oysters begin to curl around the edges, about 3 or 4 minutes. Taste and adjust seasonings. Serve over hot, cooked rice with hot French bread and filé offered at the table. Cook's Notes: Gumbo is a dish that only improves with advance preparation, so make it ahead of time if possible. The flavors really need time to settle and mellow. It's always better the next day. Prepare, let cool and skim any accumulated oil off the top before storing. If you prepare this with duck, roast the duck, reserve the fat that accumulates and use that for your roux, taking it to a chocolate color. This is a great place to use leftover chicken or turkey from the holiday. Simply skip the first part of the recipe, letting the gumbo base simmer for 30 minutes, pick up with the sausage and simply add the chicken in just before the oysters, to warm it through a few minutes. Sounds like a delicious dish Mary. Tell your FIL I'm available to be adopted and will move to the area duing sack full of oyster season. They just opened some new reefs so I'm sure we'll be seeing some more Larry! Thanks Anne & you know, I was thinking about you today for some reason! Hope you're doing well & Merry Christmas!! I've never had oysters; I don't care for clams--I'm a little reticent of this recipe for that reason. the rest sounds delicious! Well, I just got a good education on file`! Thanks so much. I know I would love the oyster gumbo a lot. I usually use shrimp, scallops and chicken. Hope you give it a try sometime Kat! I liked that episode of Feasting on Asphalt when Alton Brown found the guy that hand grinds file with a stump and a wooden "bat" of sorts. Impressed me very much, although, I never had a problem with okra, love that stuff. Yeah, I don't think you'll see me hand grinding my own but it is much more powerful than commercial for sure, and probably a lot more flavorful. And ditto on the okra! My Paw in Law never adds okra to his oyster gumbo so I went with the file, though I prefer passing it at the table since it doesn't reheat well. Made a large pot full for Super Bowl Sunday. I double the recipe, and I like a dark roux so stirred it for 30 minutes. Also love okra so added it to the mix. Great recipe Mary. AS AN 85 YEAR OLD NEW ORLENS BORN GUY I KNOW A GOOD GUMBO RECIPE WHEN I SEE ONE AND YOURS IS THE THE BEST AND POSITIVELY THE MOST AUTHENTIC I'V SEEN ON THE INTERNET. JUST LIKE BOTH GRANDMOTHERS AND MY MOM'S GUMBO.